Kielder Water is a wild and beautiful place, rich in folk music and legend. Years ago, before a great dam was built to fill the valley with water, there were farms and homesteads in that valley and musicians who livened their rooms with song. After the village was abandoned and before the waters rushed in, a father and daughter returned there. The girl began to play her fiddle, bringing her tune to one empty house after another — for this was the last time that music would be heard in that place. With exquisite artwork by Levi Pinfold, David Almond’s lyrical narrative — inspired by a true tale — pays homage to his friends Mike and Kathryn Tickell and all the musicians of Northumberland, to show that music is ancient and unstoppable, and that dams and lakes cannot overwhelm it. David Almond has received several major awards, including a Hans Christian Andersen Award, a Carnegie Medal, and a Michael L. Printz Award. He is known worldwide as the author of Skellig, Clay, and many other novels and stories, including The Tale of Angelino Brown, illustrated by Alex T. Smith, and The Boy Who Swam with Piranhas, illustrated by Oliver Jeffers. David Almond lives in northern England. Levi Pinfold has won numerous awards for his picture books, which include The Django, Greenling, and Black Dog, winner of a Kate Greenaway Medal and a Boston Globe–Horn Book Honor. He lives in Queensland, Australia. With its every detail—its masterful illustrations, its landscape format, and the elegant text that offers readers a way to see the promise of new life from what has been destroyed—this book triumphs. With riveting language and moody art, this true story will evoke awe and reverence of place for even very young readers. Pinfold’s mixed-media illustrations make the abstract concrete in carefully designed spreads that vary between small, tidily arrayed thumbnails and three-quarter and full spreads...An afterword explains that this is based on the real-life experience of folk musician Mike Tickell and his daughter, and it might be effective to draw on that text as explanation before sharing the story with youngsters to make the most of the story’s emotional impact. Pinfold's impressive artwork, sometimes full page, but often blocks of scenes covering spreads, serves as sturdy counterpoint to Almond's lyrical text. Particularly arresting are the 10 dark squares and rectangles that show the water covering all that's been before. Yet the promise of what comes next appears with the turn of a page, as people enjoy all the lake and its shore have to offer. A powerful piece of remembrance. This hints at a ghostly tale that could make nice material for oral storytelling and shared reading with some older children. It might also be fun to use in music, natural science, and local history classes. Pinfold tackles the tricky problem of how to portray music visually by painting elongated, wispy white figures whirling around the dark houses and in the night sky. This is a story that respects the past and its traditions without falling into nostalgia. Perhaps the most extraordinarily lovely and melancholy picture book published this year, The Dam will linger in readers’ minds. But what sticks with you after the book is closed is not desolation and defeat; it’s blue water and open skies, exuberant children, dancing stars and, of course, music. This is a beautifully written story about loss, hope, and folk music...These illustrations are very powerful and give the reader a great sense of hope and sadness. Between the words and illustrations, this story would be a wonderful addition to any classroom. Especially useful for readers to experience the importance of illustrations and what they can add to a story. 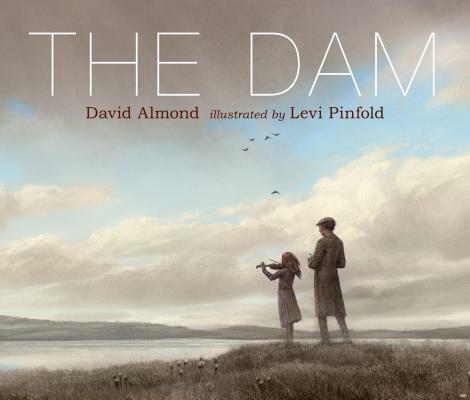 Before the dam is finished and the valley flooded, a father and daughter visit one last time to fill the doomed homes with music in this haunting book featuring David Almond's trademark narrative magic and dramatic sepia illustrations by Levi Pinfold.